Blessed Kateri Tekakwitha, Virgin, has not yet been canonized. 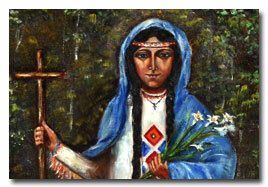 Kateri was born near the town of Auriesville, New York, in the year 1656, the daughter of a Mohawk warrior. She was four years old when her mother died of smallpox. The disease also attacked Kateri and transfigured her face. She was adopted by her two aunts and an uncle. Kateri became converted as a teenager. She was baptized at the age of twenty and incurred the great hostility of her tribe. Although she had to suffer greatly for her Faith, she remained firm in it. This entry was posted in Saints, Uncategorized and tagged American Saints, Catholic, Holy men and womem, Saints. Bookmark the permalink.